ambitious professionals and recent graduates who want to become experts in business law and exert international influence. a rigorous program that combines a solid foundation in global affairs with a comprehensive legal perspective. conscientious, globally minded leaders who have the necessary skills to manage global operations and challenges with a sustainable business approach. This isn’t just another master’s program—it’s a chance to transcend both borders and academic disciplines, and become the kind of professional whose legal, political and cultural expertise knows no bounds. 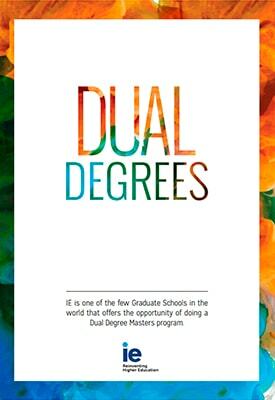 This Dual Degree combines two rigorous programs to strike the perfect balance between a holistic international perspective and an advanced legal education. The Master in International Relations from IE School of Global and Public Affairs prepares students to face any global challenge with an innovative and sustainable vision. The LL.M. in International Business Law from IE Law School teaches them to manage global legal transactions with a business approach through international exchanges, legal venture clinics and practical methodology. In today’s globalized world, an international perspective is not just an advantage—it’s a necessity. By working directly with large companies, international law firms, organizations, governments and NGOs, students gain a global mindset that helps them excel in any position and any sector. In just 18 months, they acquire the skills, knowledge and experience necessary to go out in the world and make a difference—whether through legal practice, policy-making, entrepreneurship or any other area. As a student at IE Law School, you are exposed to real-life scenarios and the latest developments in the legal field. Most of the professors are also practitioners at some of the most prestigious law firms and companies, and bring all of their experience to the classroom. Aside from academics, the student body is comprised of graduates from various backgrounds and makes for a truly enriching experience.